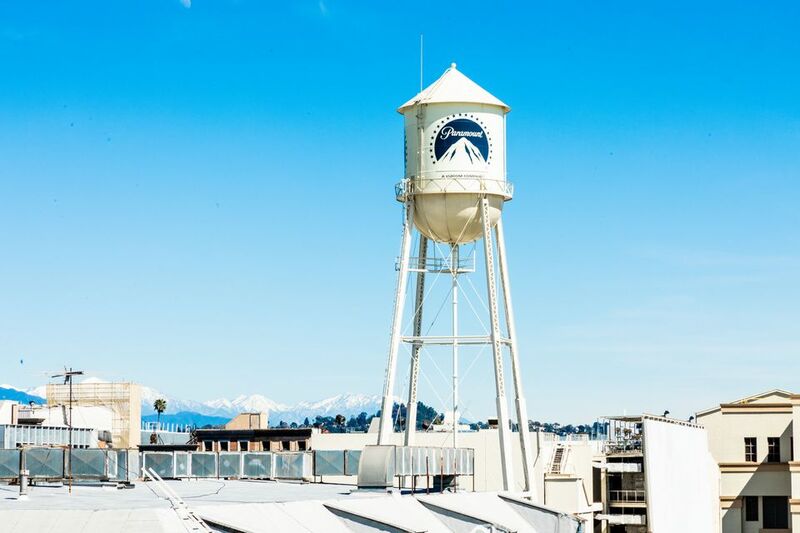 The Paramount Studio Tour is one of the most popular movie studio tours in Los Angeles. Paramount Pictures is the only one of the tourable studios that's right in Hollywood, so it's easily accessible. It's also one of the most recognizable, with its signature Paramount Pictures Bronson Gates at Melrose and Bronson. Founded in 1912 as the Famous Players Film Company, which merged with distributor Paramount Pictures Corporation in 1916, it is the 2nd oldest film studio in the United States after Universal Studios. The studio gave rise to the very first movie stars, including Mary Pickford, Douglas Fairbanks, Gloria Swanson and Rudolph Valentino. A few movies and TV shows you might recognize from the last half century that were made by Paramount include Iron Man, Titanic, the entire Star Trek franchise, Indiana Jones, the Transformers movies, Cheers, MacGyver, Family Ties, Monk, Dr. Phil, Glee, and NCIS: Los Angeles, to name just a few. There are also non-Paramount production companies including other major studios who lease stages on the lot. Paramount Pictures Studios currently consists of thirty sound stages (there's no #13), an outdoor backlot area, a massive Blue Sky Tank area that subs as a parking lot, offices, production and construction buildings on 65 acres along Melrose Avenue between Gower Street and Van Ness Avenue. The north side is backed up against Hollywood Forever Cemetery, so Rudolph Valentino hasn't strayed far from the studio that made him a star. The campus has its own hospital, fire department, bank, hair salon, dry cleaner and other amenities. In recent years, most movie production has moved to other locations, so the Paramount lot is used primarily for TV shows. The Studio Tour is the long-running traditional 2-hour tour of the 65-acre studios that combines driving around in a tour cart with some walking around on a couple sound stages and the backlot. Tour Hours: Tours are offered daily every half hour from 9 to 4 on weekdays with some schedule variations on weekends. The VIP Tour is a 4 and a half hour tour offered twice a day on weekdays that includes lunch on the morning tour or champagne and hors d'oeuvres in the afternoon. In addition to seeing everything that's on the regular tour, you get added access to the archives and other behind the scenes areas. Paramount After Dark is a 2 and a half hour tour offered Thursday or Friday through Saturday, depending on the season. Unlike the regular tour, this one is all walking. It starts with a champagne toast in the Commissary, then takes you with flashlights through a couple dark sound stages of working shows. You'll visit the screening and projection rooms, an old film vault, archives and the New York set on the backlot, where you'll be treated to your favorite movie snacks before getting your souvenir photo taken, then heading to the prop room while you wait for it to be printed. Locations will vary depending on which spaces are in use. You must have full names for everyone in your party when you make the reservation. All guests over 18 must show a valid ID. The Paramount Studio tours are either a combination of an 8-person tour cart plus walking around, or just walking. On all studio tours, most of what you see is the outside of big-box buildings where magic is produced inside, but you don't get to see it. Guides use an iPad to show you movie or TV clips from shows that were filmed there and share stories about the history. Guide expertise and personality varies, so you may get a guide that really knows movie history or one that just knows the script. For all tour levels, the tour varies depending on what is currently in production and whether they are shooting, but they all start with an intro and film in the Tour Center, opened in 2015, which also has an exhibit of Oscar and Emmy statues, costumes and movie prosthetics and memorabilia. Weekday tours in filming season have less access to inside sound stages, but even nights, weekends and on hiatus you're usually limited to the bland stages of Dr. Phil and/or The Doctors. With a little luck, you might get to visit a more interesting sitcom stage – most frequently Nickelodeon's The Thundermans - but don't count on it. The backlot is much smaller than Universal Studios or Warner Bros, so there's not as much to see or as much outdoor filming going on and you're less likely to have to suddenly stop and be quiet while a nearby camera is rolling. The one big outdoor set at Paramount is the New York set, which reopened in 1992 after it was burned down in 1983. It's included on most tours, but occasionally gets skipped if something is shooting there. Even though there's little traffic on the weekend or after hours, we did see one of the stars of Rizzoli and Isles breezing by in a golf cart on our night tour. Regular tours include a visit to a prop house, theater, and the Studio Store. After Hours and VIP tours also visit the archive, which has a couple small rooms of props and costumes displayed, screening and projection rooms, the executive dining room and the executive offices. VIP Tip: The VIP tour is only offered weekdays. Since shows are taping on weekdays, you're less likely to get inside a soundstage. Call ahead to find out which days have the lightest taping schedule, and whether the morning or afternoon tour is most likely to get stage access. Discount tickets for Paramount Studio Tours. Most discounts for Paramount have been eliminated, but you may be able to find discount codes that still work, including this one. You can also get onto the Paramount Studios lot by attending a TV Show Taping. Paramount Pictures Studios is a stop on the Red Line of the Starline Tours Hop On Hop Off bus tour. Information was accurate at the time of publication but may change at any time. Check the Paramount website to confirm details and make reservations. The Paramount Studio Tour starts in the Tour Center with an intro video and a small exhibit of costumes, props and awards. Tour guides carry tablets to show video clips of movies and TV shows shot on different parts of the lot so you can see the settings in action. Paramount is the only studio you can tour that's located right in Hollywood with a view of the Hollywood Sign. During the After Dark Tour, there's a stop on New York Street to enjoy movie snacks and beverages. You never know what you'll find in the prop house exhibit at Paramount. the vehicles and props come and go as some are recycled and reused and props from new movies and TV shows are added. An up-close view of the hatch door from Interstellar in the prop room on the Paramount Studio Tour.